Supports pairing two smart devices at the same time. As long as the phone has Bluetooth, you can connect to the Audi audio. This product has a button, you can switch the U disk and Bluetooth mode, red and blue lights indicate the status. Bluetooth mode, after the successful pairing of the phone and Bluetooth, you can choose music playback on your phone, and the car audio can be played. Length of Cable: Approx. 38cm/15"
1. Only suitable for the car with 3G MMI System, neither 2G nor 3G+ !!! 2. Does not suport Audi A4, A5, Q5!!! Please note: 1. Only suitable for the car with 3G MMI System, neither 2G nor 3G+ !!! 2. Does not suport Audi A4, A5, Q5!!! Fitment: Audi Series 2010-2016 A1 A3 A4L A6 A6L A7 A8L Q3 Q7; Volkswagen Series 2010-2016 Tiguan Golf 6 GTI CC TT Magotan. Music Device Compatibility: iPhone 4/4S/5/5S/5C/6/6 Plus/7/7 Plus, iPod Touch (4th, 5th Generation), iPad (1st, 2nd, 3rd, 4th, Air), iPad mini, Android device (playlist not displayed), Windows Device (playlist not displayed). Supports pairing two smart devices at the same time. As long as the phone has Bluetooth, you can connect to the Audi audio. This product has a button, you can switch the U disk and Bluetooth mode, red and blue lights indicate the status. Bluetooth mode, after the successful pairing of the phone and Bluetooth, you can choose music playback on your phone, and the car audio can be played. U disk mode, as long as the U disk has songs files, plug in this line of USB interface can be, the car audio can play. Note:Support 5V voltage only!!! 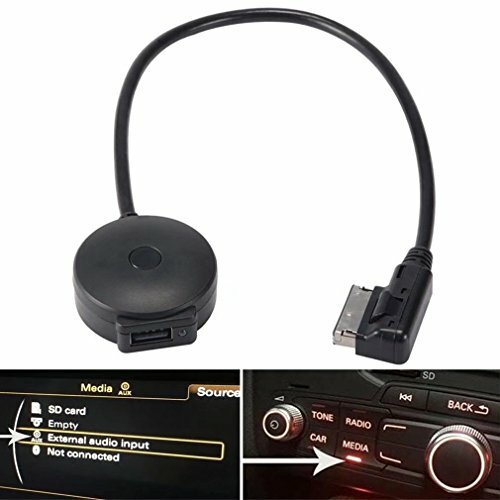 The compatibility information provided for this Audi Bluetooth streaming adapter interface is provided as a guide only. Please ensure that your Audi Multi Media Interface (MMI) system is 3 Generation.There may be more than one Bluetooth adapter available for Audi vehicles, please view all of the available options. Notice : not supports HFP AVRCP, not supports hands free phone call.It's support for getting your mobile music playing through your car stereo.